Do you know where you’re going on holiday next year? Most of us have a vague wishlist of places we’d like to visit, but often don’t actually organise our holidays until the last minute. These days, bucket lists are all the rage. People are busy compiling lists of things they’d like to do, and places they’d like to go. But sometimes these stay as lists forever and the dreams remain just that, a dream. However, imagine someone has bought you a Gift Voucher for a holiday… At that point, you’d go straight to the holiday company’s website or browse through their brochure and start making real plans. Those vague thoughts of heading to the sun to learn Italian or improving your painting skills on a Tuscan hillside start to become a reality. Giving someone a voucher for a holiday is a spur. They’re particularly good for people who are a little nervous about booking a trip on their own. The voucher makes taking that first step easier. Maybe you know someone who is new to the idea of going away alone and needs some gentle encouragement. 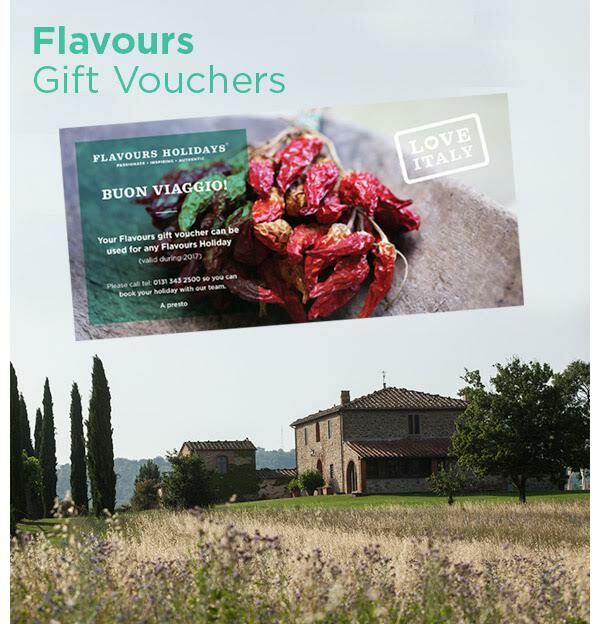 For the nervous traveller, a Flavours Holiday Gift Voucher is ideal, as it means visiting beautiful Italy, but also learning or improving a skill, which although nerve-wracking, boosts self-confidence. Flavours activity holidays include cooking, Pilates, painting, learning Italian, and photography, and suit all levels. They’re also in small groups of like-minded people, so they’re social, with plenty of good conversation over wine and great Italian food, while also offering space to do your own thing. The learning part acts as a talking point, too. Our guests invariably exceed their expectations of what they can achieve, and when you’re feeling inspired it’s great to have others to chat through the day’s activities with. Being single on one of our trips is never an issue. We positively encourage solo travellers and never charge a single supplement. And if you’re reading this thinking, ‘Mmm, this sounds like a gift for me…’, well, then it’s time to start dropping hints to those members of your family who are wondering what to buy you for Christmas! To buy a Flavours Holidays Gift Voucher, give us a call on 0131 343 2500. They’re available at any amount.